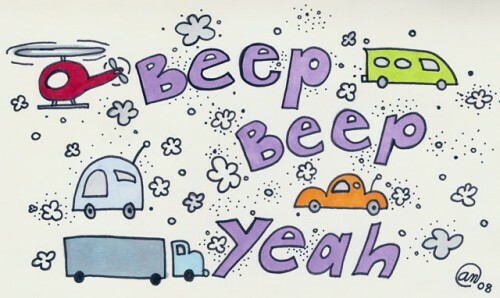 Beep, Beep, Yeah is another pen and art marker drawing from my Moleskine journal. Oddly again inspired by the Beatles’ (“Drive My Car”). This drawing was created the morning after the last Beatle inspired drawing. I love the song and with all of the current gas price craziness, it really stuck in my head. The daily drive to work is this symphony of noise and pollution, that we all have to endure. I wanted to make it playful and less threatening. Maybe this drawing will help you feel the same way.